Hi! This is game 36 on Kookyrabbit! 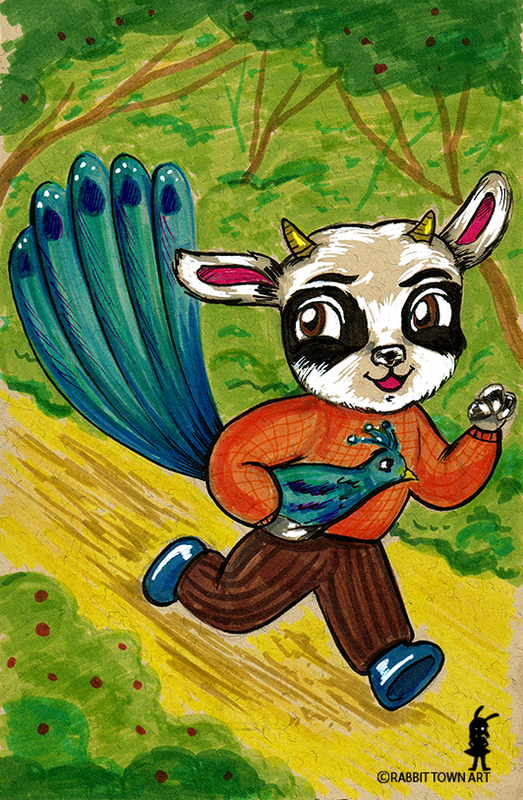 Astri drew a peacock and I decided on a goat. Our 1 year anniversary of playing this game is coming up soon. We're doing a marathon drawing night at her place on July 09. Should be great fun. Busy week thus far, am almost done with this second book. I should submit everything before lunch time tomorrow and then I have studio work on Friday working on an animation gig, staying the night at my friend's place in the city since I have urban sketching first thing Saturday morning and then Rob will come and join me in the city in the afternoon/ early evening. I am hoping to finish all work by lunch time so that I can finish off another illustration for redbubble and I also have to do some social media stuff for Kookyrabbit. I've gotten plenty of jobs based on original illustrations I did for fun (the current toddler books I'm working on is a good example of that). It's been good having clients screen cap a drawing, send it back to me and say "we want this". Pretty awesome. I've also been selling work on my shop and am getting a kick out of it! Redbubble even tells me the location of where people have bought my stuff. The big spenders all seem to be in Europe. Pretty cool! I haven't made enough money out of it to live on since I only get a small cut but it can certainly buy me a few lunches and pay a bill! Anyway, that's the fun thing about this being a hobby. I am not pressured about it making money or not! In the long run though, I would prefer to just sell my own work and have it pay all the bills...would be nice! Though I would probably miss hopping from project to project as I find that fun too!